Duke university officials did not return our calls for a response. We did, however, hear from another “blue” community, “I don’t think Lucifer is being overly sensitive. Blue people have been discriminated against for centuries.” Claimed Papa Smurf, an elder in the local Smurf community. 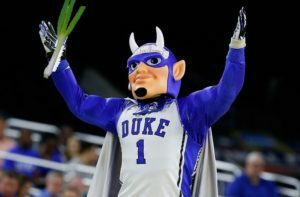 One has to wonder at the timing of this as the Duke basketball team seems to be on pace toward the NCAA final four, if not the favorite to win it all. This article was published on Mar 30, 2019 . It is tagged Blue devil, Duke, Smurf. You can follow any responses to this article through the comment RSS feed.